Julia (the Protohome project leader and visionary – well, it’s true – because she has both envisioned and functioned as catalyst for (and within) this project – asked me to write a blog entry. As all members of the project have been or will be invited to do. Urk. Heart missed a beat. Creativity. First thought – nooo – someone else would be much better talking about THAT. Anyone else would be much better-placed to talk about THAT. The instant Nyree-knee-jerk-reaction to the word creative. But, I like a challenge. Sometimes especially when it’s one I don’t really want in the first place. I’m a bit contrary-weird like that. So. Why is this, I’m now asking myself? Creativity. Dictionary definition: “the use of imagination or original ideas to create something”. Yup. For a long time now I’ve thought of myself as someone fundamentally lacking in imagination, originality, creativity – but utterly adored, supported and celebrated it to the nth degree in others. I mean that’s been a HUGE part of my life. As a daughter, sister, mother, friend, employee, colleague, leader, supporter. HUGE part in the sum of the whole me. However, when it comes to myself – not so much. Like not at all. Like to the point of freezing whenever the situation arises that I’m asked to ‘create’ something (improvise music – give me sheet music ANY day – someone else’s creativity to attempt to interpret) or draw a picture (draw a stick man even)(draw lines and circles even, for goodness sake! )[this latter part from a recent art class, which I attempted, for two sessions only, at Crisis Skylight Newcastle], or simply (simply? ha!) “write down all the things you would do with £1million and unlimited possibilities” [part of a recent goals workshop – also at Crisis]. Unbelievably (to me) I wasn’t always like this…. My early report cards, i.e. throughout primary school, (from first day at school until last day of primary 7) [my mum kept every single one], all speak of a lass with a huge imagination and fearless capacity for creating and communicating – art, music, drama, movement, writing – the whole kit and kaboodle. That’s also consistently evident through four school changes during that period alone – as my parents’ business of big building & renovation projects were all our homes, for the most part. My introduction to the Protohome Self-Build project came via my only very recent discovery of the wood workshop at Crisis Skylight Newcastle. I had tried many other things at the centre, but hadn’t spotted the workshop before. Daughter of a carpenter, growing up loving the smell of wood and watching my Dad, Grandad and other craftsmen at work – and having been given my great Grandad’s beautiful old saw not long ago (one of the few things to survive my move from cottage to car-homelessness), I thought – why not? Do it! So I did. But. I got the days wrong. I turned up for Creative Woodwork, not DIY woodwork. Froze on entering the door. Muttered something about being good to come back on the proper day. But Dom (the tutor) encouraged me to stay – in amongst all of the already-busy creating folk, (some of whom I’d previously encountered and been in awe of their talents in the art class), all, without exception, making hugely diverse and truly beautiful things out of wood. I stayed – and for the next matter of weeks, twice a week I’d have a spring in my step as I headed to the workshop to practice sawing and drilling and sanding and whatever….in my little space amongst the ‘real creatives’ and making notes about it all (what tool, what technique) in my notebook, to report back to my Dad on our now nightly phone calls, since mum died last year. Then one afternoon Dom said there was a project coming up that he thought I’d be very interested in. 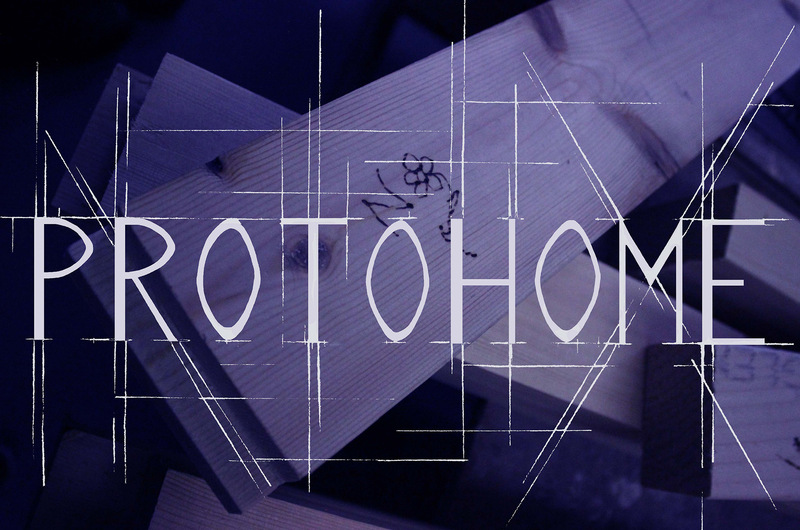 Protohome. I said “YES please – where do I sign up?”, before he’d finished describing the bare bones of it. So here I am, just weeks in – and already part of this individual experience of self-discovery and collective-participation building. Because it isSELF discovery – to the nth degree – and it’s happening so quickly and fully (I think) because of the collective, participatory, supportive environment. It’s made me think of the times I’ve volunteered (Amber Films cinema, Star & Shadow Cinema, Comfrey Project, to name only a few) and how much I’ve got out of that collective participation. It’s more than enjoyable – it’s……..energising and empowering. I’ve discovered that, other than watching my kids (x5) grow and launch into ‘themselves’ – and music (oh MUSIC!) playing and listening – working with wood is another indefinable ‘something’ that makes the heart, brain and core of me, vibrate and makes me internally sing like a loon. It’s not confined to the 3.5hrs on Mon/Tues for Protohome or the 3hrs Tues/Fri in the regular workshop sessions – or the Saturdays spent deconstructing the old Star & Shadow Cinema (in preparation for reconstruction and development of the new building) – either. It’s actually (with no exaggeration here) spilling over and then out into the way I tackle, prepare or do….anything. Job applications, volunteering, business planning, cooking, my social activities, my living situation and my interactions with folk, in each and any given setting…and with me, myself, Nyree. There’s a new self…..not just confidence…….self-assurance. I’m discovering – and quite possibly learning to love and celebrate parts of me that I’d most likely never noticed were actually there all along. With the added bonus of being highly receptive to learning and discovering the potential of…..more to come. I’ve never (I think) been afraid to have a go, or get stuck into something – a project, a problem, a situation. I’ve always had this deep down trust that nothing was impossible, really; that no problematic or physically or emotionally difficult experience didn’t have some possibility somewhere for a positive outcome. Even if only just the benefits of coming through the experience itself – the good, the bad AND the ugly. What doesn’t kill you makes you stronger, right? Or in my case – and what I usually tend to think these days (like Batman’s (Heath Ledger) Joker) – stranger. I am what I am! I don’t know why then – high school onwards – the lack of belief in my own talents and inherent creativity. (Apart from one determined and joyful period between 17 and 18, when I ditched all university offers and took myself and trombone a-knocking at the Royal Scottish Academy of Music’s door. Though a combination of personal factors and yup, deep down belief that I was a fraud and didn’t really deserve to be there anyway – resulted in my departure in only the second term of my first year). I do KNOW that I’ve been a walking/talking contradiction – by supporting and encouraging others to explore their own passions, talents and…..creativity!…..whilst denying it in myself. So what’s changed – and why has it changed – and so quickly, too?! I don’t know how to express it properly. It’s a common failing of mine, which usually results in kooky metaphors and Nyree-isms/expressions, which only folk very used to me are able to even half-decipher! To have a stab at it – I think, fundamentally, that being involved in a collective, community-based, socially-grounded-and-rooted project, like this, allows real growth and change across the board – and at a rapid pace, to boot. Construction. Solid, long-lasting, sustainable construction – which itself has room for growth, expansion and continuing development – all involves tapping into both the individual and collective, collaborative skillsets and creativity. NOT something our current government seems to understand or champion. NOT something our education system, OR our capital-loving, money as both basis-and-a-marker for success, non-environmentally-nurturing, destructive rather than creative(!) and constructive, societal system of values celebrates. Well, mostly. For of course there IS a ‘wealth’ of the good stuff happening out there – with good people, places and spaces – and I can honestly say that I feel privileged incredibly lucky to repeatedly find myself discovering them. So it’s simple(!) really. No, really it is. Or it ought to be. Like anyone else – I am creative. There. I both acknowledged it and stated it. I’ve been actively creative all the time – without discreet, self-perceived gaps. It’s actually impossible to exist without being creative on a daily basis – in order to function. Whether that’s been in finding my own way to raise a family, tackle a work project, a course, cook a meal, improvise (I was doing THAT too?!) when I didn’t have the ideal tools, or money, time, strength and energy (or fixed abode) to make it work. I think what I’ve also been – is – my own worst critic, as well as conversely my own support team and motivator. (For the most part, that is – because latterly I HAVE had and still have some amazing family, friends, lovers, colleagues and complete strangers, who have all given me their love, help and strength, when I could actually bring myself to accept it.) By hitting rock bottom (tho’ truthfully – I never, ever, at any point saw it as that), or maybe….more of a plateau, where I both realised and accepted that, actually, my best plan-of-action would be to seek out a wider support team (both professional and informal/staff and members of Crisis; medical and fitness professionals; benefits and support services; organisations and charities) in order to ‘arm’ or equip myself with the best tools and techniques available to do the job of not only recovery, but of building a far healthier, far stronger/more resilient…and sustainable me. Again – the project’s a metaphor for all that. The creative part is not on the peripheral…..the creating and creative part? It runs like a river throughout it. NOT that you/we would want a river running through the house. I think the image or the thinking (such as it is!) to my mind, is that….it flows – and if you have that ‘flow’ in what you do – it’s both healthy, empowering and (exciting to feel) energising. When you lose it – or lack the belief that you’re capable of it – those thoughts block and disempower and….are exhausting. I’ve read and loved the whole poem so many times – and bizarrely, coincidentally, it made me, when I first read it, (aged 39), immediately write a poem about myself beside it. On the blank back cover of the book (heinous crime!) Without pausing or stopping to think about it. Just doing it. In ink. Committing to it. Lost in the flow of it. Writing creatively for the first time since I was a kid – and actually something I’ve never repeated again since. Oh. Until now, I guess, haha. So – what have I done within the project so far? I’ve learned the names, uses and techniques involved with a variety of hand tools associated with carpentry/joinery/building. Creatively – I’ve taken what I’ve learned and through trial and error (and asking a lot of questions/watching), I’ve worked out how to create and continuously develop a way of working (by healthy trial and error) that fits/suits me. In addition to that, I’ve learned to put pencil to paper (and mouse to computer program) to start creating and working on designs that are specific to my own imagination. HUGE. I’ve also felt completely free to add my own thoughts to a creative discussion about how to make the letters/signage for the building – and even quickly half-scrawled them on paper to illustrate my meaning. Could I have come so far or so quickly, working alone – or in a business/commercial/competitive environment? Not a chance! Think bucket of intensely concentrated food colouring dropped into a pond, or a lake – from a great height. Can you picture it at all? THAT kind of effect. If that makes ANY kind of sense, hahaa.